Fundraiser by Alberto Callo Valenzuela : Help Coastline get to Ireland! Help Coastline get to Ireland! Few countries love the fiddle as much as Canada, and few young Canadian fiddlers today can show off the breadth and range of fiddling like the youth fiddle ensemble, Coastline. 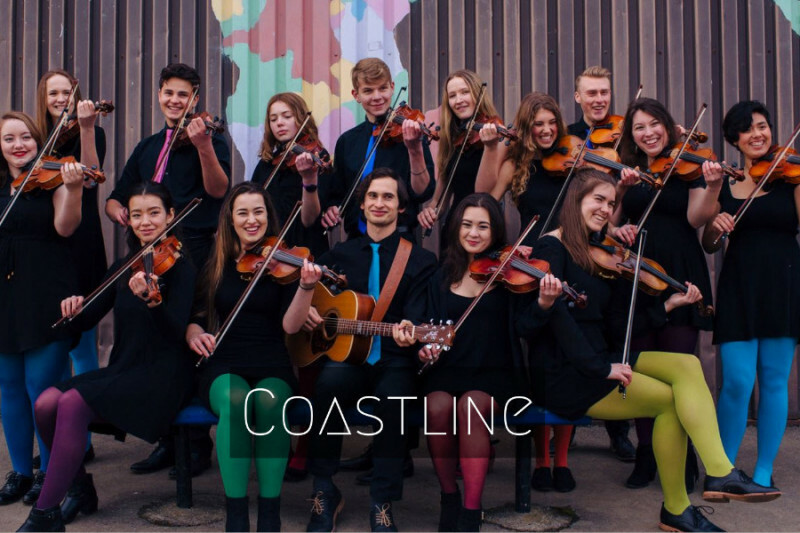 Coastline is a string ensemble consisting of 15 of BC’s top young musicians ranging in age from 16 - 21, coached and mentored by internationally acclaimed musician and composer, Ivonne Hernandez. With intricate arrangements of traditional, original and contemporary fiddle tunes from around the world, Coastline is pushing boundaries and always having a great time whenever they play. A 2015 two-time nominee for Young Performers of the Year and Instrumental Group of the Year from the Canadian Folk Music Awards underscores the power of Coastline’s musicianship and range of their vision and passion. Over the course of Coastline’s relatively short history of 4 years they have had the pleasure of working and collaborating with some of the world’s top musicians such as Alasdair Fraser & Natalie Haas, Katie McNally, The Fretless, Mairi Rankin, Wendy MacIssac, De Temps Antan, Colleen Eccleston, Fintan O’Brien, The Gettin’ Higher Choir, Oliver Swain and Daniel Lapp to name just a few. Coastline is so excited to be taking their Canadian West Coast Fiddle sound to the birthplace of this music genre. Coastline will have the opportunity to perform, collaborate with other musicians, attend workshops and visit the local sites while soaking up the undoubtedly life-changing experience. These opportunities reflect Coastline’s deep commitment to learning, sharing and improving quality of life through music and proving that music has no boundaries - although, there is an ocean to cross. There are 17 of us going which includes the 15 members a chaperone and our Music Director, Ivonne (we love you Ivonne for your tireless commitment to us and the music). This translates into a lotta’ cash for transportation and accommodation … well you get the picture. We have been working so hard fundraising and are now crowdfunding here for some help to cross that ocean. We come to you with our hearts and fiddle cases open, seeking a small donation to support our tour to Ireland. Thank you so much for anything you are able to offer us. We will be acknowledging your support, with huge gratitude, any time we perform! Please visit our website at: www.coastlinefiddle.com for more information and updates. We hope to see you soon and thanks for the wonderful support and love! Thank you to our first set of donours!! Thank you to our first set of donors! your support is very much appreciated. Coastline was delighting the audiences in Comox and Port Alberni shows this past weekend. You can see them live again this April 28th at the Greater Victoria Festival of Performing Arts held at UVIC.